Better Markets has just released a report – Wall Street’s Six Biggest Bailed-Out Banks: Their Rap Sheets and Ongoing Crime Spree. 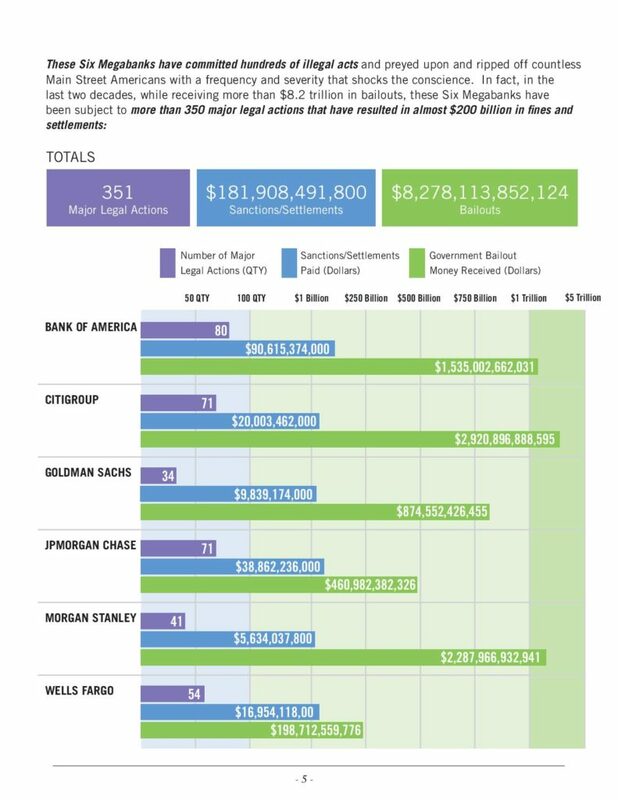 The report, for the first time, details six large bank taxpayer bailouts, the crime spree before, during and after the 2008 financial crisis, and the fines and penalties involved. “This report details, for the first time, that, of the more than $29 trillion in total bailouts, the six biggest banks in the country – Bank of America, Citigroup, Goldman Sachs, JPMorgan Chase, Morgan Stanley, and Wells Fargo – received more than $8.2 trillion, or nearly one-third of the total bailouts provided to the entire financial system,” said Dennis Kelleher, President of Better Markets. “One might think that receiving trillions of dollars of undeserved and lifesaving taxpayer bailouts would cause those financial institutions to reform their high-risk, destabilizing activities or, at a minimum, to rein in their predatory conduct and illegal practices. Think again. The banks showed no gratitude, no remorse, and no willingness to reform their activities,” the report found.